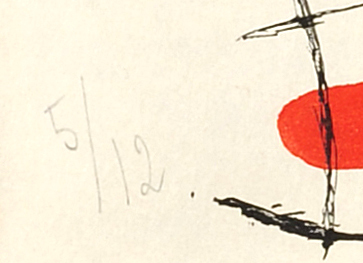 Numbered from the edition of 12 in pencil in the lower left (from a total edition of 110); published by Iliazd, Paris. 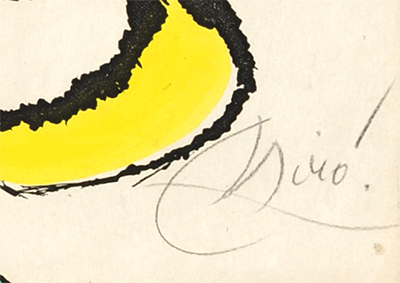 This work is hand signed by Joan Miró (Barcelona, 1893 - Palma, 1983) in pencil in the lower right. 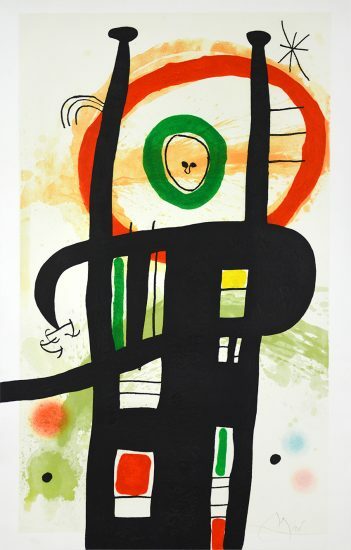 Joan Miró Etching and Aquatint Plate 11 from ‘Le Courtisan Grotesque (The Grotesque Courtesan),’ 1974 displays two abstracted figures rendered in Miró’s signature style. 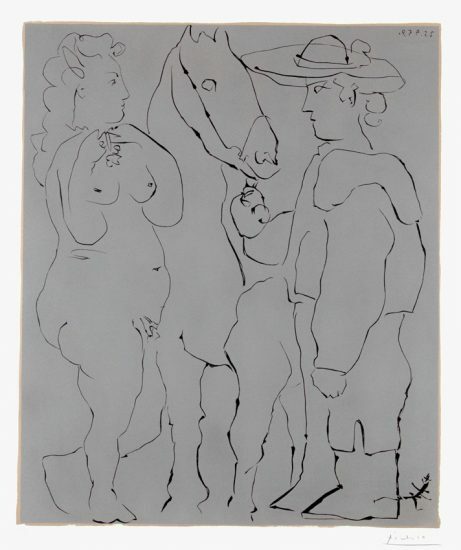 The figure on the right is more angular, with straight, black lines making up its outline. 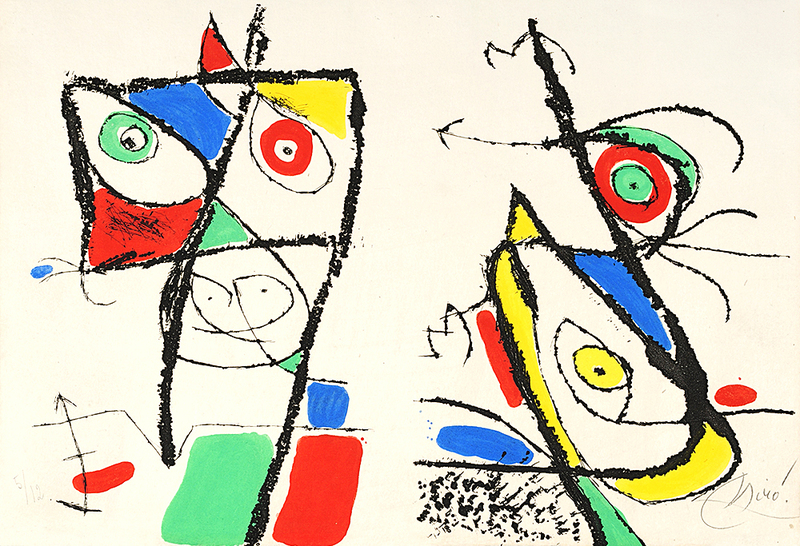 The intersections of the lines make hollows, which Miró fills with bright colors in blue, green, red, and yellow. The crayon-like texture of the black lines adds complexity to the work, and we are drawn in by the inquisitive and spirited eyes of the figures. 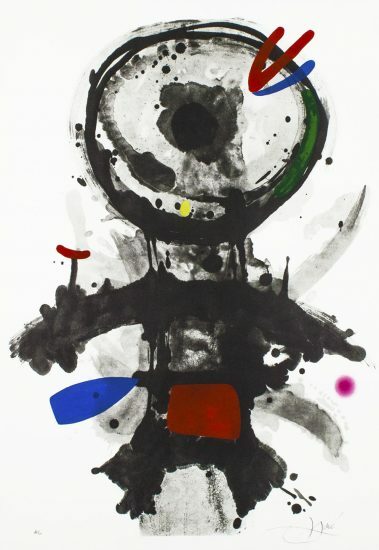 Miró is a master at abstractly toying with bodies, and we see that expressed wonderfully in this work. 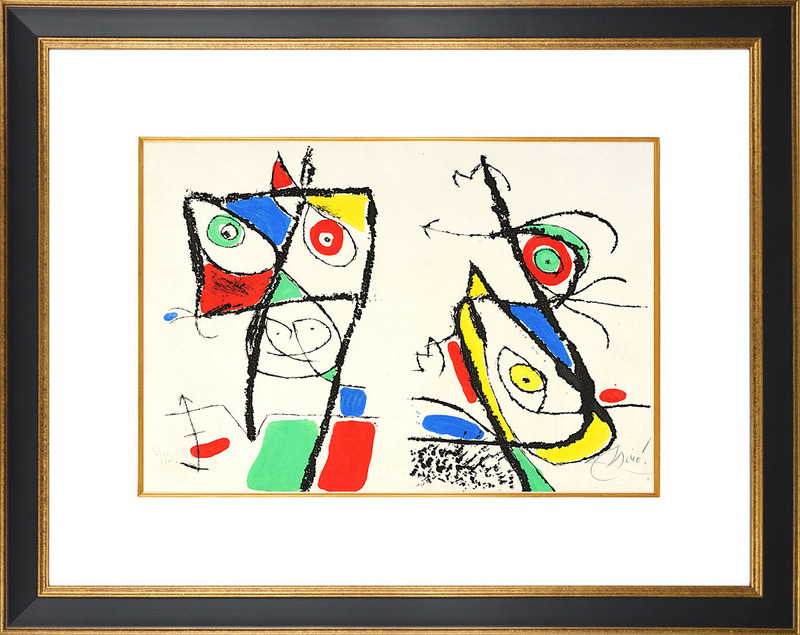 The use of bright, primary colors gives the piece an even more playful tone. 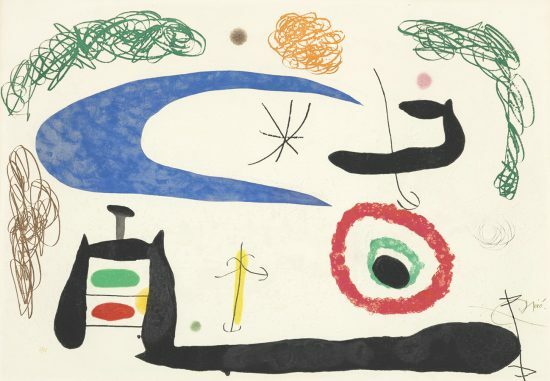 Created in 1974, this color etching and aquatint on Japan paper is hand signed by Joan Miró (Barcelona, 1893 - Palma, 1983) in pencil in the lower right and numbered from the edition of 12 in pencil in the lower left; published by Iliazd, Paris. 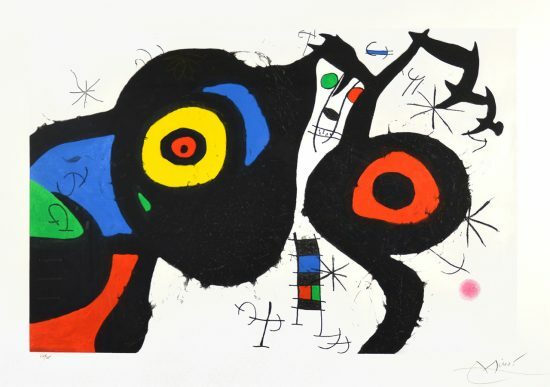 Joan Miró Etchings and Aquatint Plate 11 from ‘The Grotesque Courtesan (Le Courtisan Grotesque),’ 1974 is fully documented and referenced in the below catalogue raisonnés and texts (copies will be enclosed as added documentation with the invoices that will accompany the sale of the work). 2. 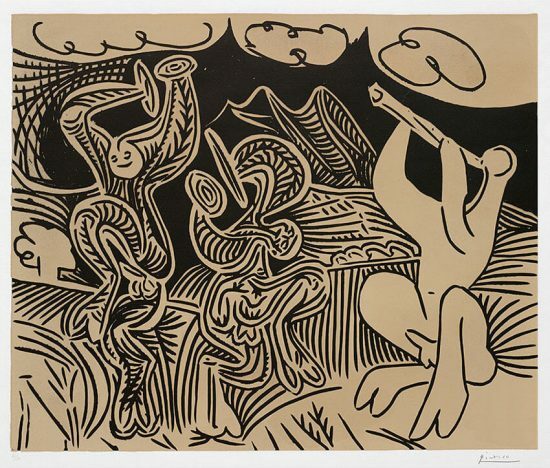 Dupin, Jacques. 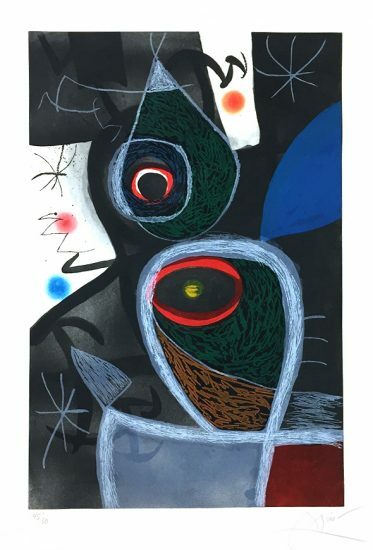 Miró Engraver Vol. III 1973– 1975. New York: Rizzoli International Publications, 1989.Listed and illustrated as catalogue raisonné no. 670. 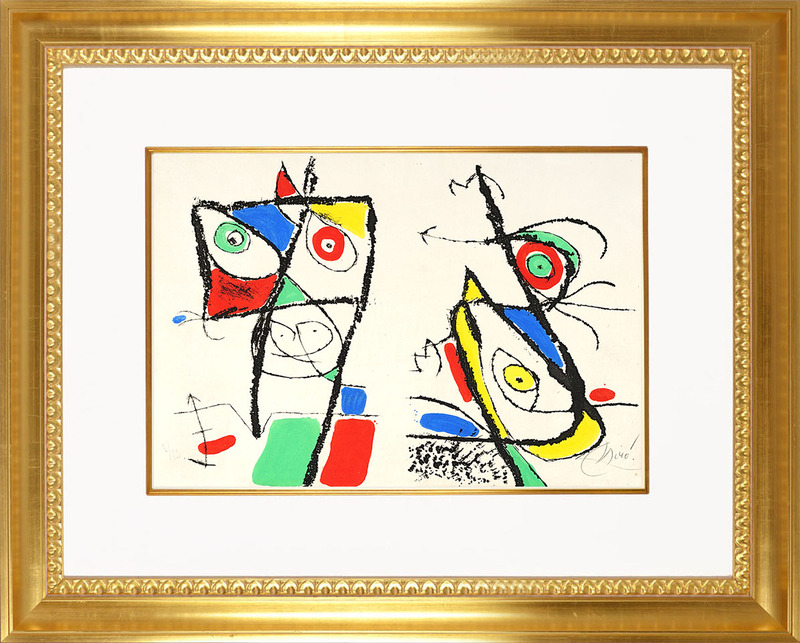 Framed to museum-grade, conservation standards, Joan Miró Plate 11 from ‘The Grotesque Courtesan (Le Courtisan Grotesque),’ 1974 is presented in a complementary moulding and finished with silk-wrapped mats and optical grade Plexiglas.